Known in racing circles as The Derby Stakes or simply as The Derby in England, The Epsom Derby is the mother of all flat races. Inaugurated in 1780, The Epsom Derby is the most prestigious and popular flat race in the world. Despite being over 220 years old, The Derby is still as famous and as thrilling as on May 4, 1780 when Diomed won its inaugural race. Its prize money has grown with the times as well, with today's derby offering more than �1 million (�1.25 million in 2007). Staged annually at the Epsom Downs Racecourse in Surrey, England, The Derby is held traditionally on June's first weekend each year. 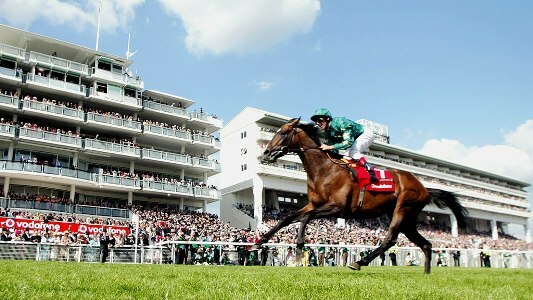 The Epsom Derby ranks among the five British Classic Races. It is the second crown of the English Triple Crown along with the 2,000 Guineas and the St. Leger. The Epsom Derby, which involves a distance of one mile and four furlongs, brings together some of the best three-year-old colts and fillies in the world, although fillies have become rare in recent years. In its long history, only six fillies have ever gone on to win the Epsom Derby, the latest of which was Fifinella in 1916. Today, the Epsom Downs Racecourse hosts separate races over the same distance for fillies (Vodafone Oaks) and older horses (Coronation Cup). Each colt in the Epsom Derby carries nine stone while fillies carry eight stone and nine lbs . Contenders typically tune up for the race by participating in any of a series of races in England and Ireland known as the Derby Trials. According to the record books, 16 Epsom Derby winners previously competed in one of the trials during the 20-year period from 1988 to 2007. The winners of the Epsom Derby typically go on to compete in the major events in the international racing calendar, especially the Breeders Cup in the USA and the Prix de l'Arc de Triomphe in France. The Epsom Derby has been the site of some of the greatest moments and achievements in thoroughbred racing. These include the 1995 race, which was won by Lammtarra in the record time of two minutes, 32.31 seconds, and the 1981 race won by Shergar by 10 lengths, the widest winning margin ever. The Derby has also been the site of some of the most improbably winners ever, including three 100/1 odds winners in 1898, 1908 and 1913. Moreover, the Epsom Derby has been the proving ground not only of the great thoroughbreds in history, but also for some of the best jockeys and trainers. Lester Piggott is the most successful jockey at the Epsom Derby with nine victories. Meanwhile, Robert Robson, John Porter and Fred Darling share the record for most successful trainers with seven wins each to their credit. Thousands of spectators attend the Epsom Derby every year to experience some of the biggest thrills in thoroughbred racing. Spectators are composed of people from all walks of life, the most famous being Her Majesty Queen Elizabeth, a regular fixture at the Epsom Derby. 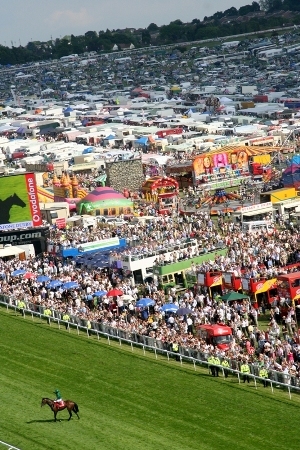 The Epsom Derby is an ideal sporting event for tourists as many accomodation options are available near the venue, the Epsom Downs Racecourse, which is about 15 miles to the sout of Central London. Tourists are encouraged to book their hotel accommodations early. The track is accessible by bus, train or taxi cab. Foreign visitors will be hapy to know that the track is a short distance (30 minutes to one hour) to three main airports -- London City Airport, London Gatwick Airport and Heathrow Airport.